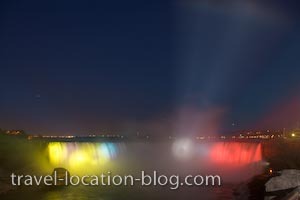 We stayed out and braved the cold evening to see the Nightly Falls Illumination. High powered lights are trained on both the Horseshoe and American Falls between 8:30pm and 11:00pm (April) - bright and white at first then gradually other colours are added and mixed. Times for the illumination vary depending on the time of year so we recommend a visit to the info centre for the correct times. This picture is of the Horseshoe Falls along the Niagara River at dusk during the nightly Falls Illumination int he town of Niagara Falls, Ontario, Canada.